How do I choose the width of my net curtain panels? On our site, you order the width of your net curtain laid flat, it's up to you to choose how many gathers you want. 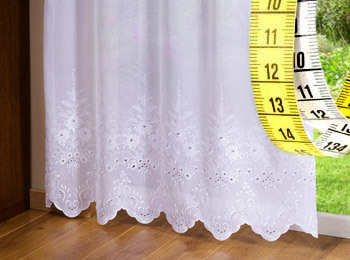 Measure the rod where your curtain will hang, the general rule is to double the width for gathers. However, depending on your taste, you can always plan for a bit more, up to 3 times, or a bit less, one and a half times, if you want fewer gathers. The width of net curtains with eyelets to choose are predefined, they are calculated in order to have a curtain with an even number of eyelets for an impeccable presentation of your curtain. How do I choose the height of my net curtains? Just measure the height from your rod or hanging system down to the ground. Generally, curtains fall a few centimeters from the ground, but you can stop your curtain where you want to. The height ordered will be produced from the first upper seam on the curtain tape or your rod pocket down to the bottom of your curtain. For net curtains with eyelets, the height will be from the top of the eyelet to the bottom of the curtain, which corresponds to the top of your rod to wherever you want your curtain to stop at the bottom. What do I use to hang my net curtains? All our curtains are made with a rod pocket, curtain tape, or eyelets, you need to make your choice when you place your order, using the scrollbar on the page concerned. 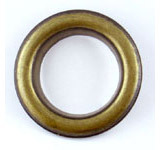 Good to know: Finishings with rod pockets or curtain tape are more economical than the eyelet finishing. 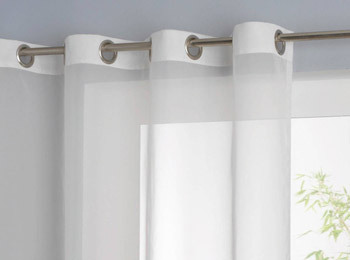 The rod pocket is a pocket you can slide your curtain rod through. We make them 1.2 inches wide. You can ask us to make a larger rod pocket, just send us an email with your order number to do so. A gathering braid is used for attachments with a rail and small hooks. 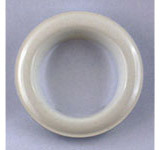 We place an "automatic" 2 inches wide gathering braid. Just pull on the strings on the sides to have regular, uniform gathers across the whole width of the curtain. Unless you make a special request, we make a 1.2 inches head at the top of all our net curtains, which lets you hide the attachment system and gives a nice finish to the curtain. This head is not included in the height of the net curtain you select, it will be in addition to it. You can contact us for any special requests. 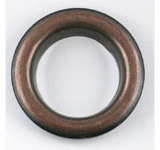 Round eyelets are used for attachment on the rod, and they have a diameter of 1.6 inches, which lets them adapt to most rods. They are mounted with a reinforcement band. 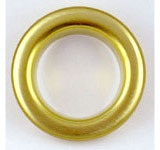 Eyelets are in matte plastic and are available in three colors: Gold, bronze, and Gunmetal. 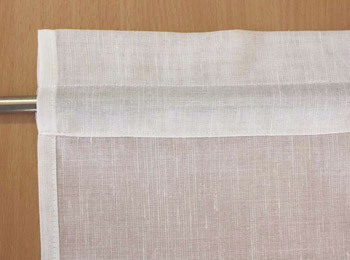 What is the difference between a "net," "sandblasted," "Terylene" or "linen" curtain? "Net" curtains are very light and transparent. They allow a maximum of light inside your house, but they still obscure the view into your house. "Sandblasted" and "Terylene" curtains are a bit more opaque and a bit thicker than a traditional curtain, but they still let light pass through. These are the great classic curtains, it is an excellent compromise between illumination and protecting the privacy of your home. Polyester and "linen" curtains are the most opaque of our curtains and the thickest. They are ideal if you want to maintain a maximum of privacy for your home. How do I choose the dimensions of my looped curtains? We recommend mutiplying the length of your rod by 1.5. 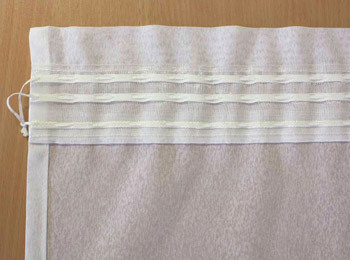 Small windows don't need as many gathers as a net curtain panel, and what's more you will have an additional gather with the tightening of the tieback. With regard to the height, measure the height of your window from your curtain rod to the bottom of the window, generally the finishing will stop at the windowframe. Dimensions ordered will be the dimensions of your finished curtain, ready to hang, including tape. What dimensions do I use for my small net curtains, brise-bise, and straight net curtains? 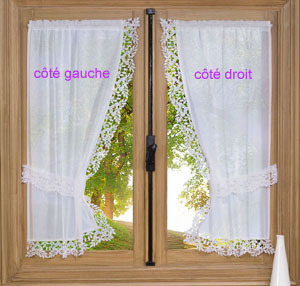 These small curtains, or "stright curtains" are generally hung directly on the window and require few gathers or are even flat. With regard to the heights of small curtains, generally we cover a window with a brise-bise that will dress the lower part of the window, either half or 2/3. You can also install a second short one, generally 30 cm, which will give the window a nice finish. However, keep in mind that there are no rules. The most important thing is to decorate your window according to your taste. You can install every height of curtain based on the landscape, or garden you want to see, or the part of the window you want to block in order to maintain the privacy of your home. There are no errors of taste. What rods can I use for my small net and straight curtains? All our brise-bise net curtains can accept a rod up to 1 to 2 cm in diameter, depending on the model. Generally, all rods sold in home supply stores will fit our curtains. Selecting a looped curtain, right side or left? Left side looped curtains correspond to a finishing braid made on the right side of your window, viewed from inside your home. Your tieback will therefore be hung on the left side of your window or your door. Right side looped curtains correspond to a finishing braid made on the left side of your window, viewed from inside your home. 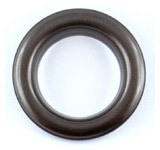 Your tieback will therefore be hung on the right side of your window or your door. Can you make a specific design? Yes, for curtains and looped curtains, we can make your curtains with a custom head or rod pocket dimension. Don't hesitate to tell us when you place your order, a field has been placed on our site just for this purpose. Are curtains sold in pairs or individually? All our curtain models are sold individually except for looped curtains which are listed as "per pair." Can I exchange my net curtains? Net curtains made to order cannot be returned or exchanged unless we made a mistake. Don't hesitate to contact us by telephone in order to verify all your measurements. We can also send you netting samples.